If you're a serious bow deer hunter, but you only have a limited time to hunt, you need to carefully choose the most opportune window to do so, to maximize your chances of getting a deer. Too many deer hunters just go out helter-skelter, and then when they don't get something, they whine and complain about "no deer being in the woods." That's total horse-hockey. We know bow deer hunters that get trophy or near-trophy deer each and every deer bow season. If you follow some simple rules, you can too. First... Go "early." The first two weeks of the season (remember bow season comes before gun season -- so you're first in the woods when it comes to going after deer) are "primo" for bow hunters. 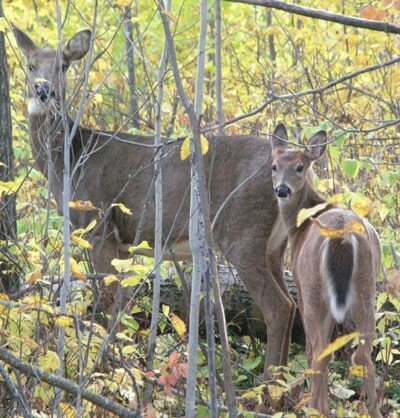 The deer have not yet been "educated" to the presence of hunters. Within a couple of weeks after the season begins, the deer herd becomes very wary, and, in all probability, that trophy buck you're after will go "nocturnal." You can kiss that Boone & Crockett record-setter "bye-bye," when that happens. Second... and guide Phil Schweik's personal favorite -- is during the rut. This usually starts around Halloween and goes up until around the second week in November. There are more big bucks taken during archery season at this time than any other. If Phil Schweik had to choose the literal day/dates to bow hunt, he'd break it down into a three or four day window, and choose November 2 to November 6, each year. "When the bucks go into rut, their guard and sense are way down, and they're much easier to target," Phil says. Third... and this is one that too few bow hunters take advantage of: Late season bow hunting. This comes after the traditional gun and muzzleloader seasons and goes from mid-December into early January. Best time to bow hunt in late season is from around Christmas to right after New Year's when the season closes. It's cold. The snow is on the ground (the more the better, because with heavy snow the deer have to stick to their traditional trails for ease of travel and won't "break" new trails, which is great for the deer hunter), and the deer have already been hunted by hundreds of thousands of people -- they're weary. With winter upon them, the deer are forced to feed more regularly to keep up their strength and viability, and can be EASILY patterned coming and going from their feeding areas. There are a few other windows of course -- like moon phases and activity times -- but the three outlined above hold the most potential for a successful bow hunt. Go get 'em!